Our dogs live together with us in our home and have a fenched yard to play and run. Of course they play every day in the woods or at the beach. We don't have kennels, all our dogs are sleeping in our house. Our puppies are born in our house between our pack and they grow up inside . We think a good socialisation is very important to the puppies. Therefore visitors (of course by apointment) are always welcome to meet our dogs and puppies. We go outsite with our young pups, for example to the mall. 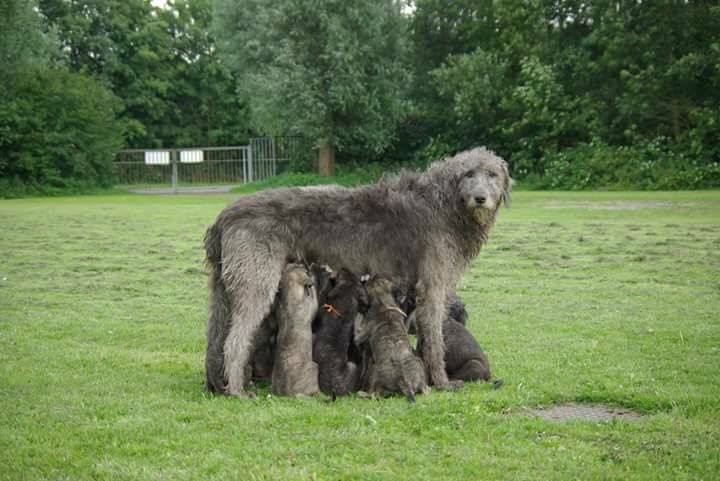 We are breeding by the rules of the Dutch Irish Wolfhound Club ( Nederlandse Ierse Wolfshond Club) . All our dogs will be heart tested on DCM. Our puppies will be tested on livershunt when they are 7 weeks young . They leave to their new families in the possesion of a pedigree and passport. They have been dewormed several times and have had their puppy vaccination. The puppies will be placed in their new families with a contract.